The disconnected undercut is so named because the hair on top of the head is “disconnected” from the sides. This means that the transition from the longer hair on top to the short hair on the sides isn’t gradual. Rather, there’s a clearly defined point where the long hair stops and the short hair immediately begins. The disconnected undercut is ideal for guys who want an exciting, contemporary look. It combines the boldness of the pompadour with the elegance of the quiff. It’s an eye-catching, fun style that works well with a hipster aesthetic. As always, we recommend showing your hairstylist pictures of the style you want. Here are the finer points of the disconnected undercut. Before you get the disconnected undercut, you’ll want a good amount of length on the top of your head. This gives the disconnected effect, since the long hair on top will sharply contrast with the short hair on the sides. The length is up to you, but about 2 inches is a good starting point. The sides are shaved with a relatively short clipper setting on the razor (#2 through #4). If you want a neat, close-cut look, you can touch up the edges of the neckline and sides with a #0 or #1 clipper. The hair on top of your head should not be cut at all; rather, it should be brushed back. This gives the sharp contrast of the disconnected haircut. The longer your hair is, the more volume it will have and the taller it will appear. Longer hair also provides a more startling contrast between the top and the sides. You can choose any type of neckline you like. Both a blocked neckline and a tapered neckline complement the disconnected undercut well. You can also ask for a slightly modified disconnected haircut. In this version, the lower halves of the sides are shaved with the #2–#4 razor. Your stylist then fades the sides of your hair so that it gradually becomes thicker until it reaches the disconnect. As you can see, the disconnected undercut can be personalized in several ways. It’s a flexible style, and you can tweak it to fit your personal style and aesthetic. This hairstyle will require regular touch-ups or trips to the barbershop to maintain its look. If you don’t maintain it, your hair will grow irregularly and ruin the style. The disconnected undercut looks best when the hair is brushed back. Using a blow dryer, push your hair backward. You can use a brush or comb to give your hair more volume. This high volume side swept style is great if you’re looking for a fashionable hairstyle that’s full of personality. We especially like how the hair hangs over the side. Simple yet stylish, Adam Levine’s haircut is surprisingly low maintenance. Because it’s so short, it doesn’t need much in the way of styling. Simply brush it back, and you’re good to go. Here’s an extra trendy style that combines several techniques into one look. A tall pompadour with a matte finish, a side part, and faded sides all come together to form this unique style. If you’re after something edgy and trendy, consider this brushed up style. The multiple textures at work here make this haircut stand out in a crowd. Do you dig the pompadour? If so, you’ll enjoy this simple twist on the classic style. The sides are kept short and thus disconnected from the pomp on top. The skin fade is an incredibly versatile technique. Here, the hair on top is messy, and the faded sides and hard part add definition. Many disconnected hairstyles feature a side part or a hard part. However, this one doesn’t, making it one of the more unique disconnected looks. Undercuts can get fancy and fashion-forward, but they can also be simple and sensible. This short, straightforward undercut retains all of the classic features of the style. This angular, asymmetrical style is a bold, striking look. A long fringe hangs down on one side, and a bald fade places all the emphasis on the hair in the front. This short, low maintenance hairstyle keeps everything neat and tidy. The hair sweeps to the side, revealing a hard part and emphasizing the faded sides. This eye-catching look is a contemporary classic. A high volume quiff, disconnected sides, and a subtle line up combine to make a dapper style. This uniform, satisfying style is the result of styling the hair with the fingers to create the even waves you see throughout. Here’s a more extreme undercut variation featuring long hair that hangs down the back of the head. Great for guys who like longer hair but want a fashionable style. This is a sort of reverse faux hawk where the hair comes to a peak at the back of the head. It’s a unique take on the disconnected look that you don’t see very often. If you’re after lots and lots of volume, look no further. This style will require fairly long hair to pull off, but the result is astounding. Here’s another style accomplished by teasing the hair with the fingers. This finger combing produces texture and can also generate more volume. 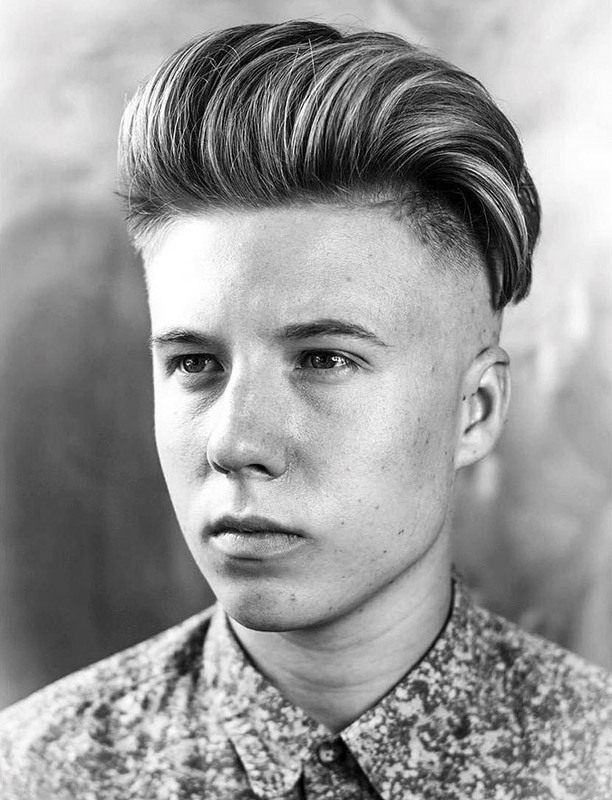 This clean disconnected undercut features a swooping quiff and balanced, faded sides. Together, these elements produce a very tidy style. Another take on the timeless pompadour, this style also has a low fade that helps to separate the sides and top for maximum definition. Shaved designs in hair are becoming increasingly popular. Here’s a more subtle use of the technique that offers a visually interesting counterpoint to the slicked back hair on top. Men with curly hair, this one’s for you. This style allows the curls to naturally expand outward, but it keeps the sides nice and tight.